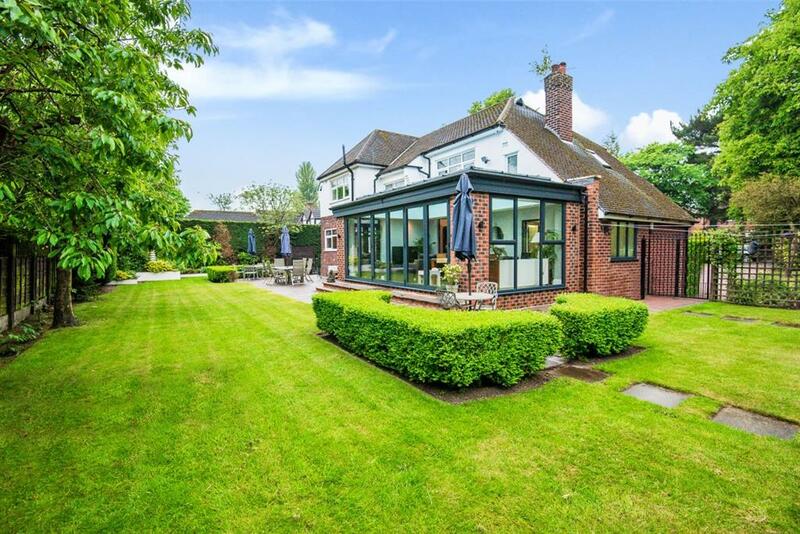 Hunters worsley is delighted to bring to the market this stunning four bedroomed detached house within the most desirable location of Ellesmere Park, Eccles. 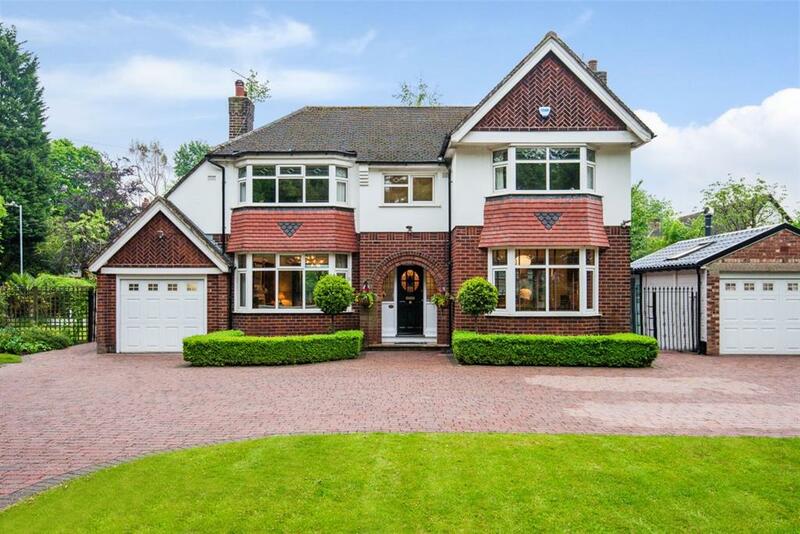 The property briefly comprises of an external porch, entrance hall, lounge, orangery, utility, garage for storage, open plan kitchen/family room, four bedrooms, the master with en-suite bathroom, and family bathroom. 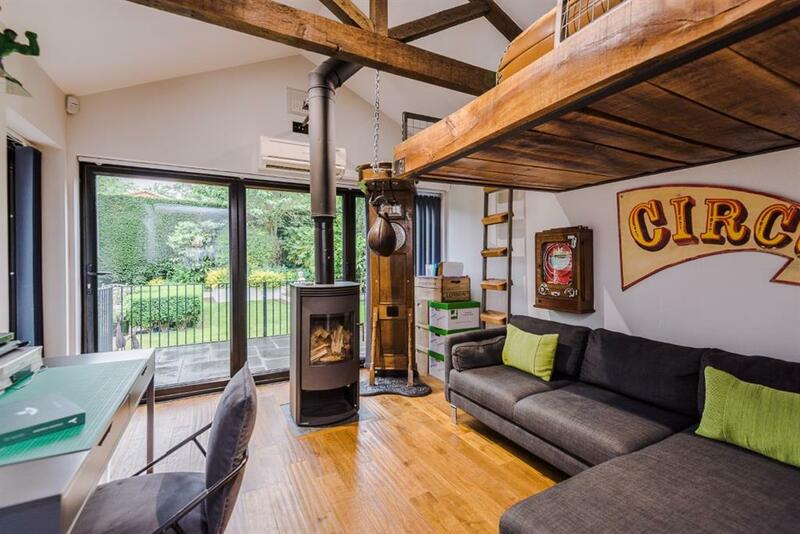 There is also a self contained Annexe which can be accessed via the side of the property or from the kitchen area. 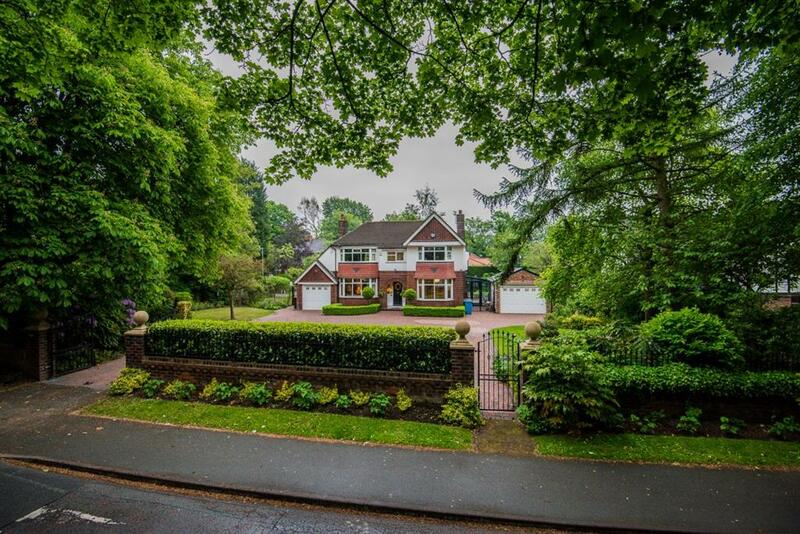 Externally the property is positioned back from the road and walled to the front with electric gated drive access and space for multiple vehicle parking, whilst the rear provides a good sized, beautifully presented and well maintained lawned garden offering Indian stone paved patio area, and complete privacy. For those wishing to take advantage of the plentiful woodland walks Worsley has to offer, Cavendish Road could not be better located, with the newly renovated Worsley/Monton Cycle Route 55 just a short cycle/walk away and Worsley Woods being a real favourite for those wishing to walk/ dog walk or cycle away the brighter of days. 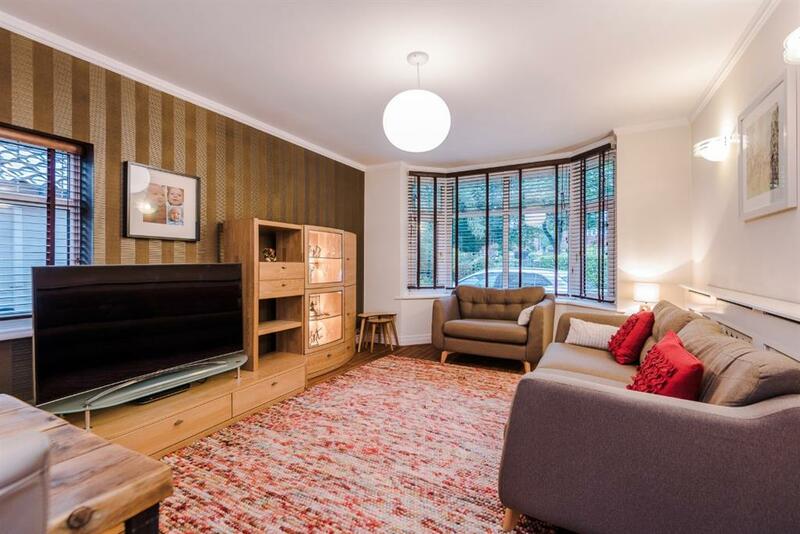 Convenient for those wishing to take advantage of the local amenities in Monton Village and with easy transport links close-by to access Manchester City Centre, Salford Quays and other motorway networks. 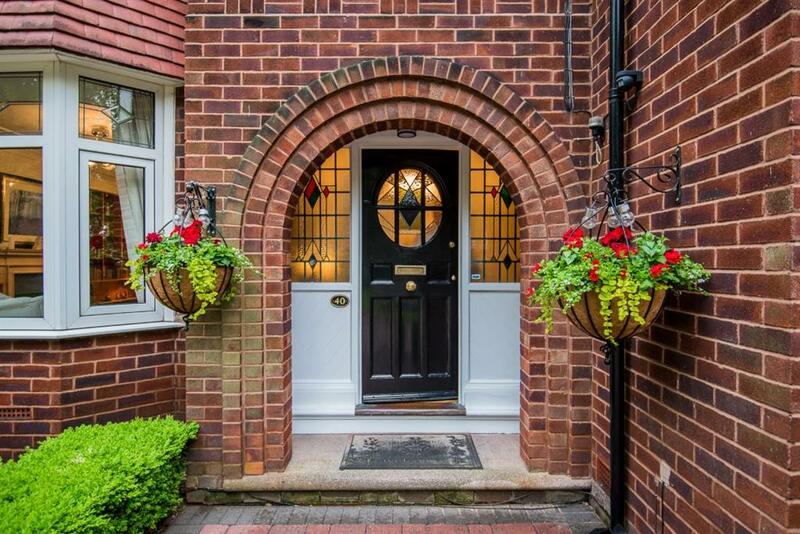 A brick built external porch allowing access to the property's entrance hall. 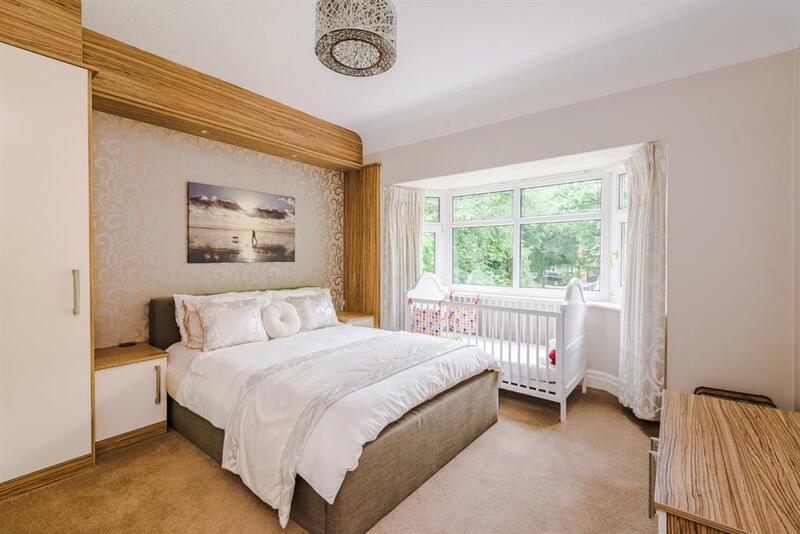 The welcoming entrance hall benefits from ceiling light, decorative coving, papered walls, picture rail, two wall mounted radiators, deep skirting boards and laminate flooring with inset welcome mat. A front aspect wooden door with round stained glass window panel, and two leaded windows to either side of the door in place. 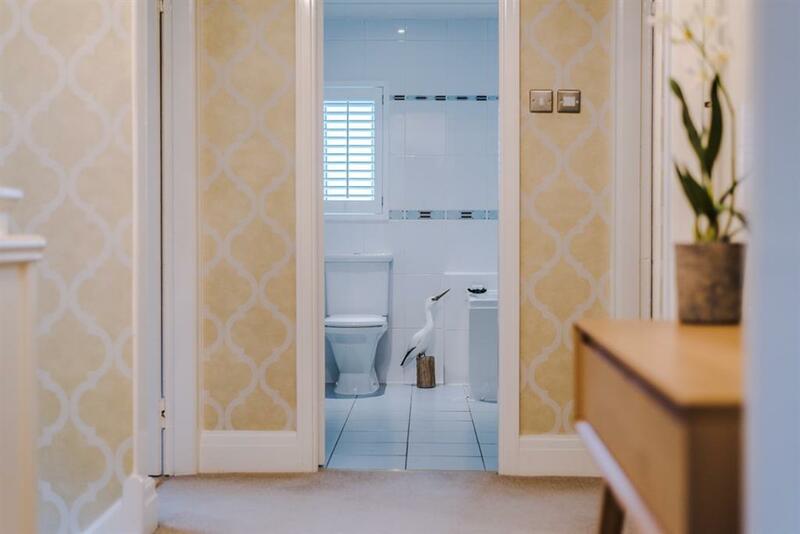 Of good size the guest w.C is located to the far end of the entrance hall and is fitted with a Villeroy and Boch bathroom suite comprising of a w.C and wall mounted hand wash basin, lighting and a wall mounted chrome towel radiator. 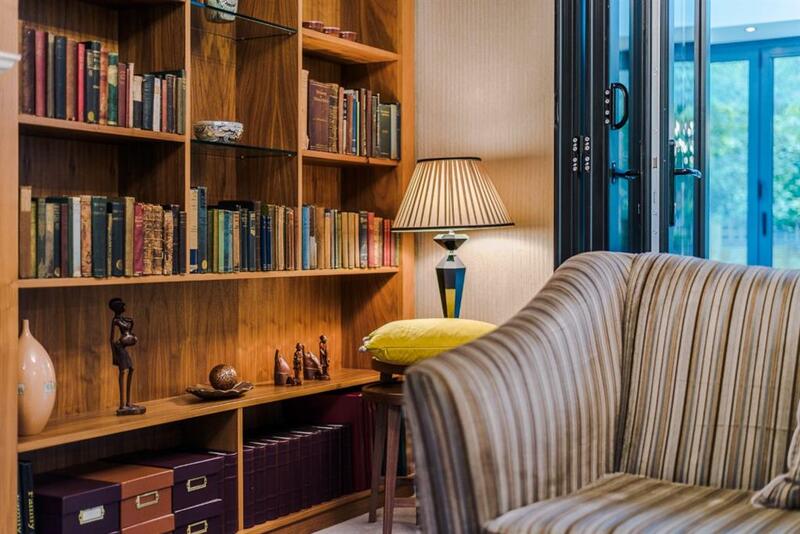 The spacious and bright lounge is located to the front of the house, and benefits from two ceiling lights, decorative ceiling panels, deep coving, papered walls, picture rail, wall mounted radiator, inset gas fire, built in alcove storage and bookshelves, deep skirting boards and beige carpet flooring. 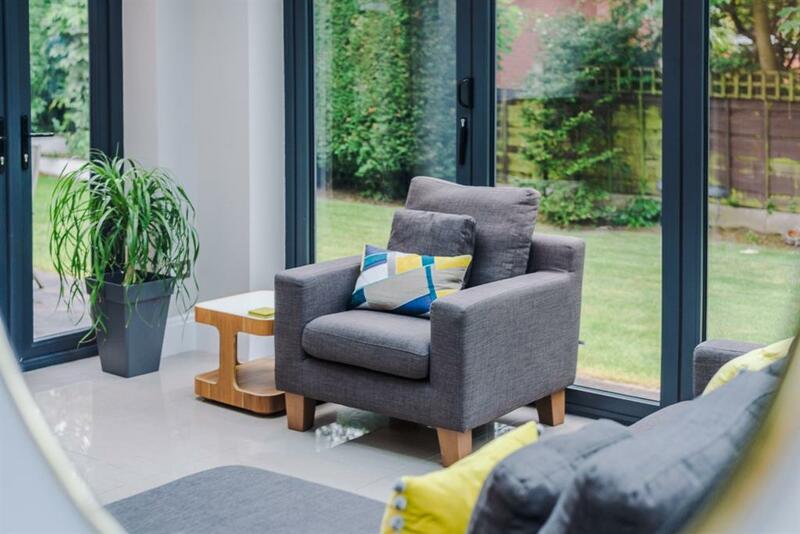 A large front aspect uPVC bay window allows for lots of natural light, and full width bi-fold grey uPVC doors to the rear of the room give access to the orangery creating an open plan flow through. 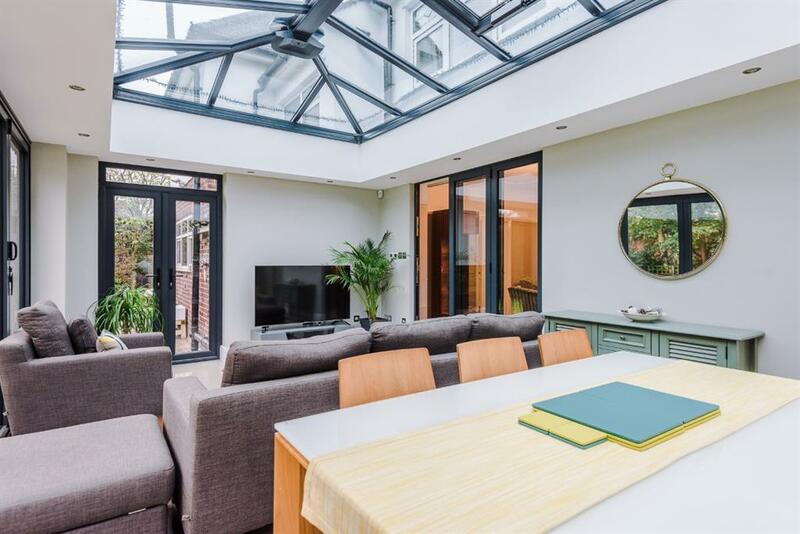 A stunning living space which truly brings the outdoors in, with an apex glass roof boasting electric opening windows and a number of fully glazed floor to ceiling bi-folding doors and windows giving access to and views of the side and rear garden. 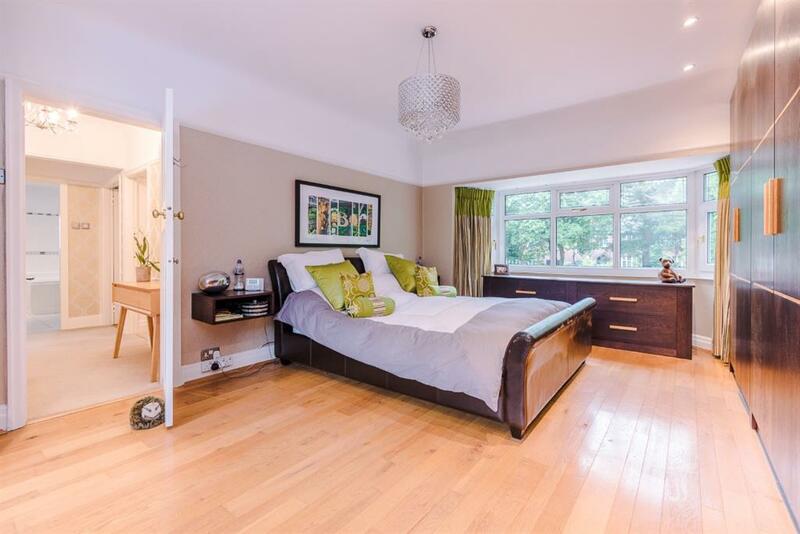 With recessed spotlights to the ceiling, deep skirting boards, ceramic high gloss floor tiles and underfloor heating throughout with wall mounted thermostat control. 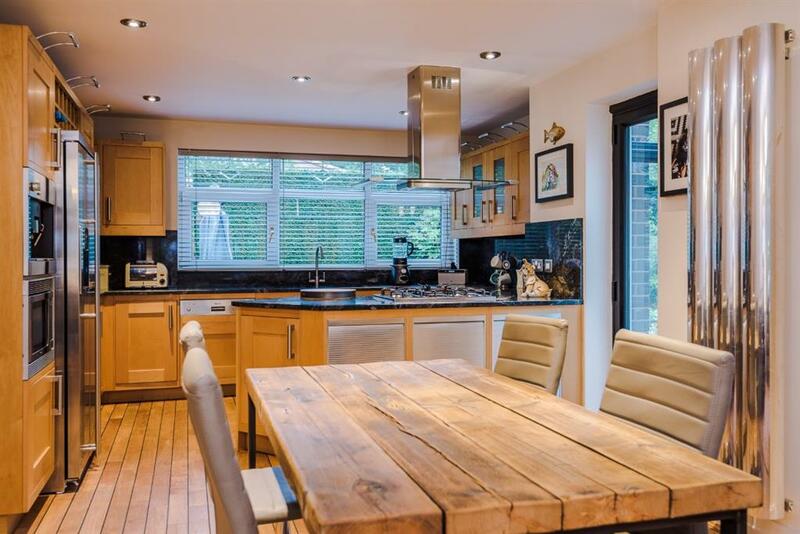 This room offers plenty of seating space, alongside room for a dining area also. 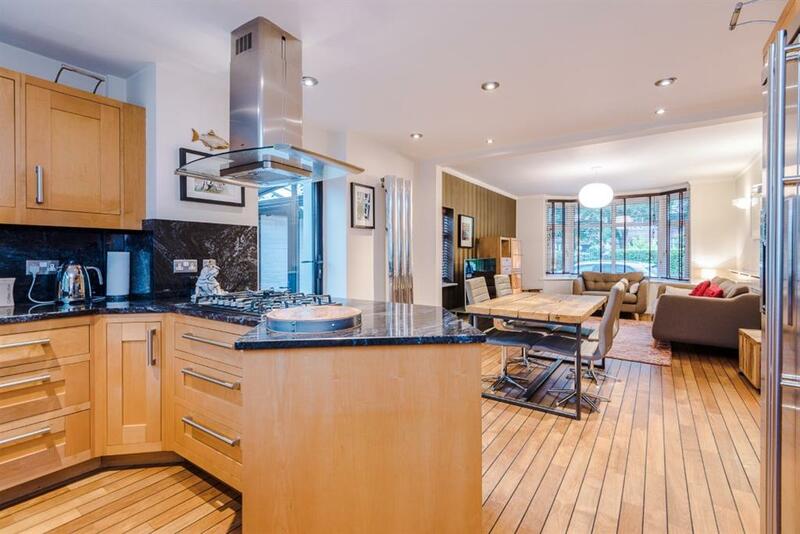 The spacious kitchen and family room provides a large open plan cooking, dining and living space. 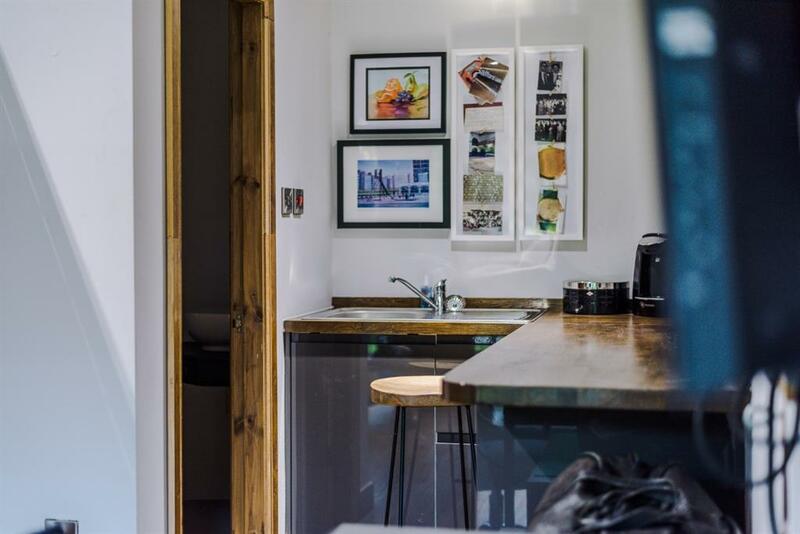 The kitchen area offers a range of solid wood wall and base units with chrome handles, black marble worktops and matching splash back. With inset double sink, inset drainer and mixer tap, the c-shaped kitchen unit space also offer a selection of integrated appliances, consisting of a double electric oven, gas hob with extraction hood over, dishwasher, coffee machine, microwave and inset American fridge freezer. 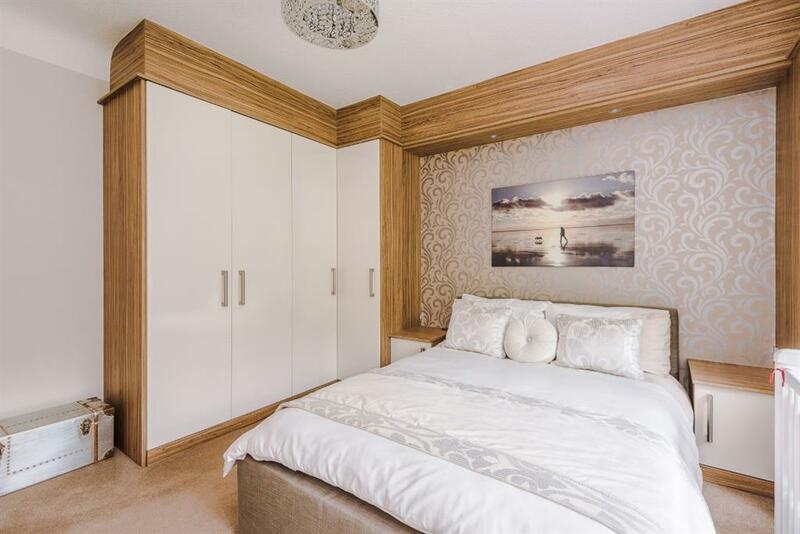 With recessed spotlights to the ceiling, ceiling light fixture and fitted lights to the top of the wall units, coving, chrome wall mounted modern radiator, painted walls, feature papered wall and wooden flooring throughout. A front aspect uPVC bay window and side aspect uPVC privacy window provides the front aspect living space with lots of natural light. 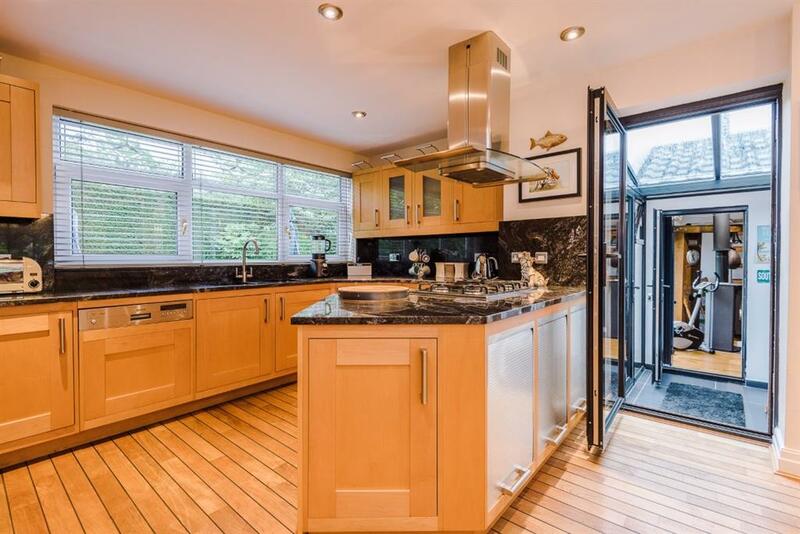 Accessed via a glass paned uPVC door from the orangery, the handy separate utility offers ceiling strip light, side aspect uPVC privacy window, black worktop with 'Husky' wine fridge, inset stainless steel sink with mixer tap and space for a washing machine and tumble dryer. 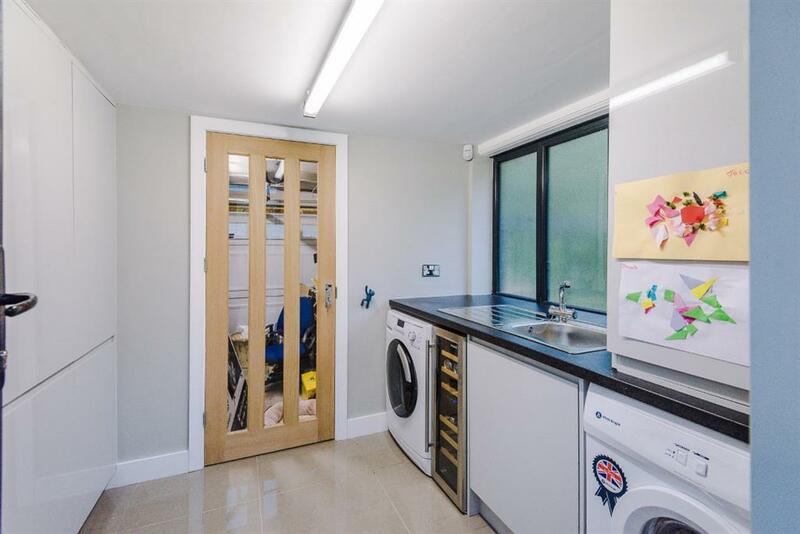 Grey soft close ceiling to floor cupboard provide further storage space, and the utility space also houses the British Gas boiler. 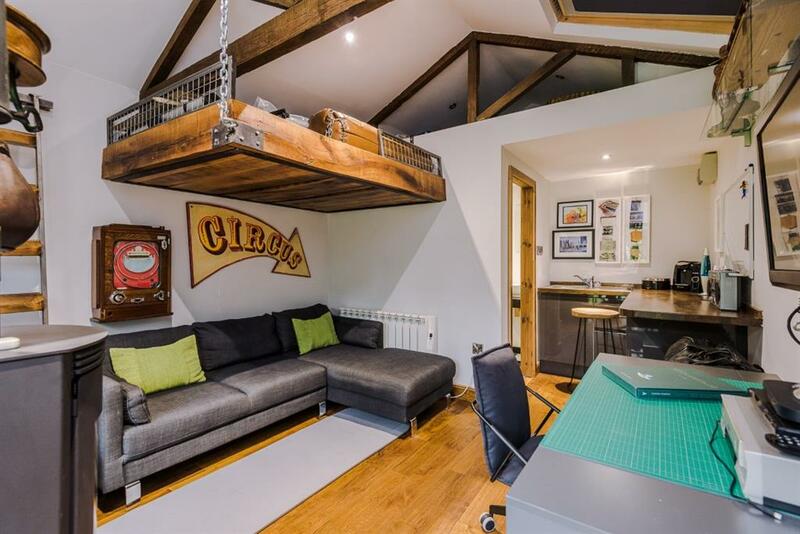 Accessed from the utility via a wood and glass panel door, the garage provides further storage space and offers lighting and an electric up and over door. 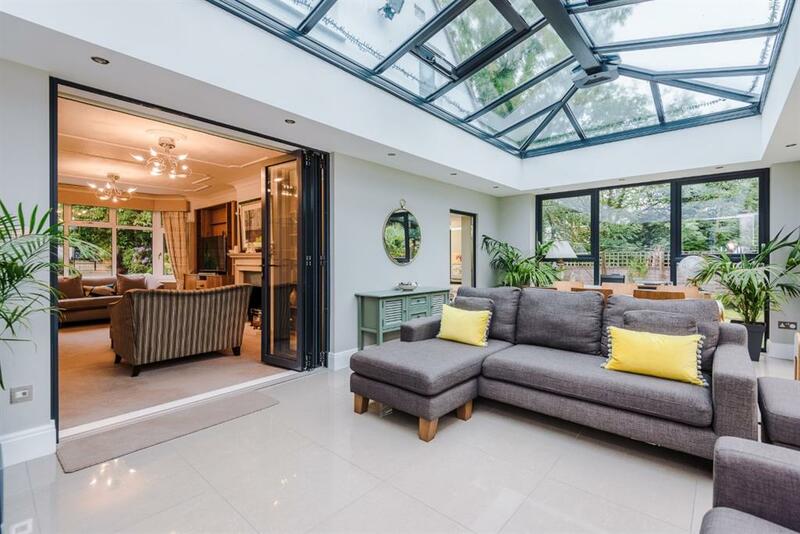 Accessed through a stunning glass corridor with stylish sloping roof, the self contained living space in the Annex benefits from it's own a entrance door, and rear aspect bi-folding doors which gives access to the enclosed rear patio area. 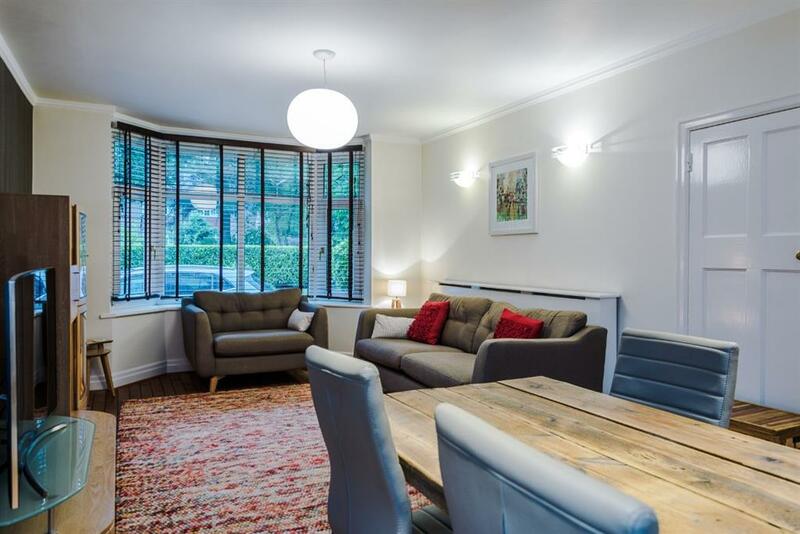 With recessed spotlights to the ceiling, exposed beams, white painted walls, air conditioning unit, Velux window with fitted blinds, electric wall heater and wooden flooring. 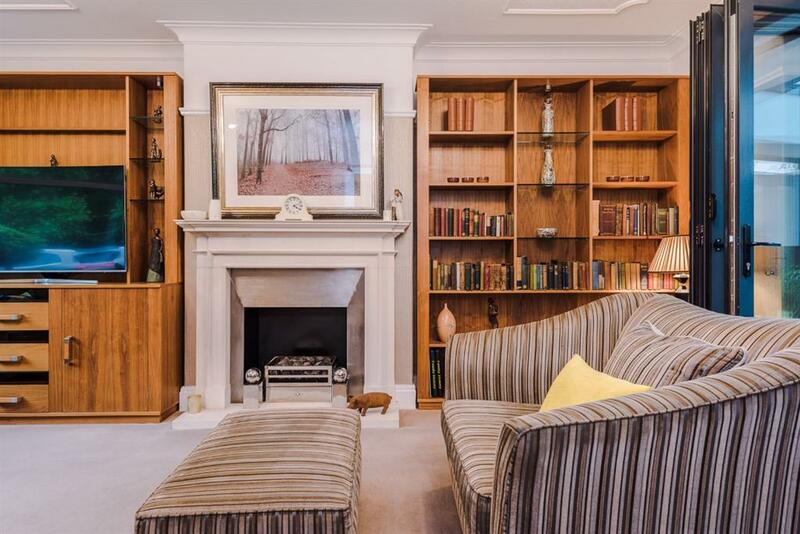 A traditional style log burner provides a focal point within the room. 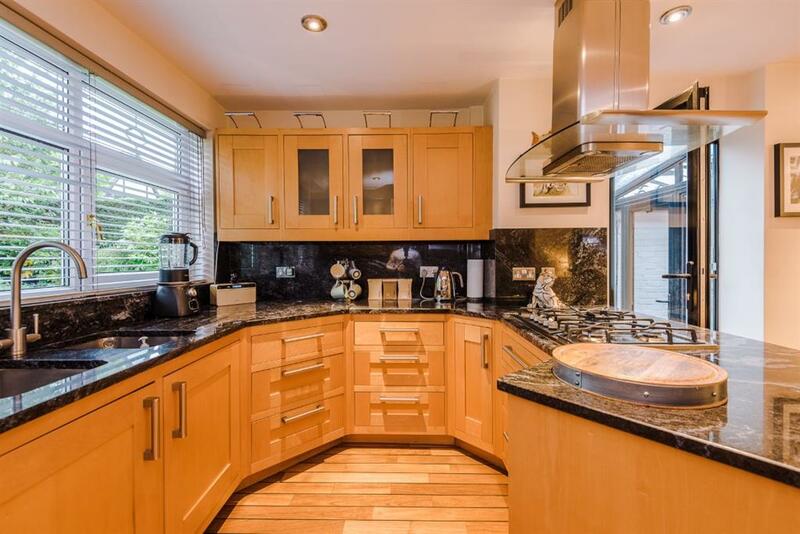 The kitchen area offers grey high gloss units with soft close doors and butchers block worktops, with integrated fridge, stainless steel sink with drainer and mixer tap. 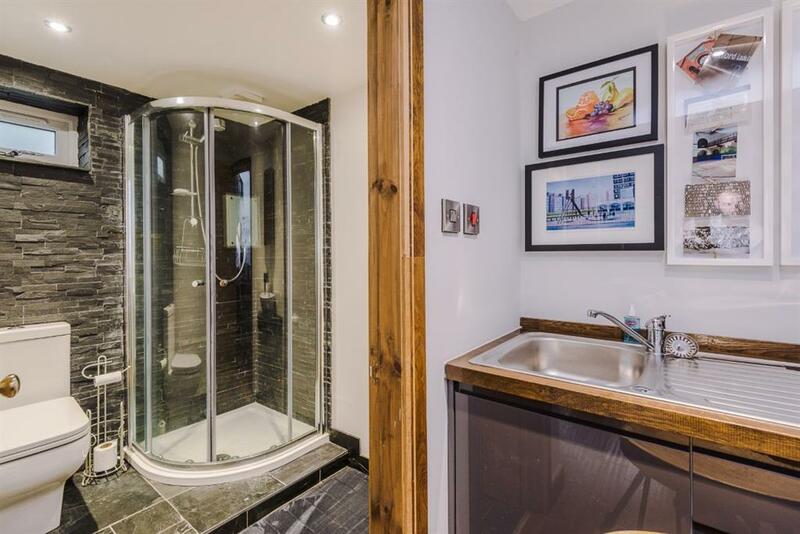 The private shower room is access via a solid oak door, and offers low flush WC, round sink, corner shower, recessed spotlights to the ceiling, extractor fan, rear aspect uPVC privacy window, chrome wall mounted towel radiator and black ceramic tiled flooring. Fitted with beige carpet throughout, the staircase offers a white painted balustrade and the landing offers papered walls, picture rail, wall mounted radiator and ceiling hatch giving access to the loft space, which is fully boarded for storage, offers installed lighting and can be access via aluminium pull down ladder. 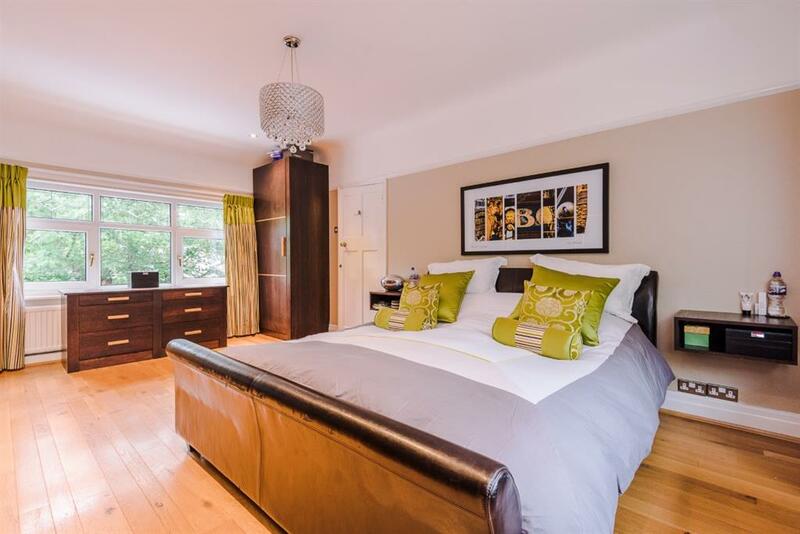 A well presented and extremely roomy master bedroom offers stylish fitted wooden robes with spotlights over, alongside two chest of drawers built into the bay window, and two 'floating' bedside tables. 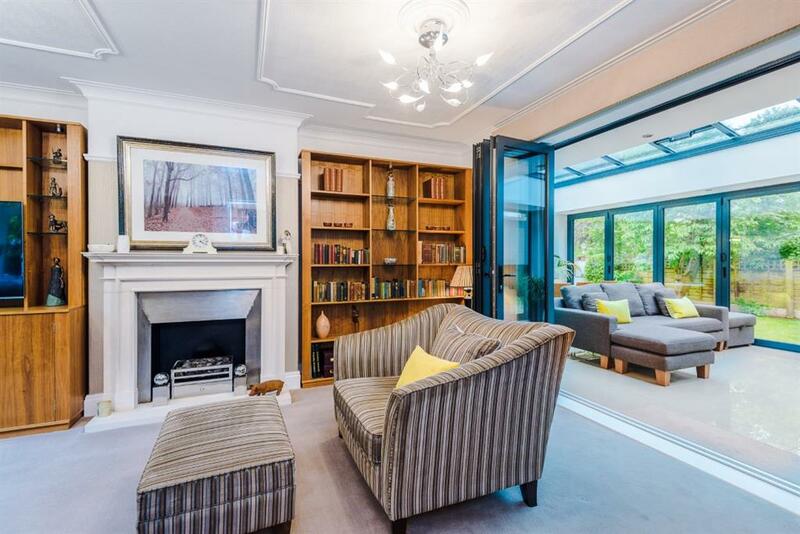 Also with ceiling light, painted walls, picture rail, front and rear aspect uPVC windows, wall mounted radiator and wooden flooring throughout. Set a step down from the mater bedroom, the private three piece en-suite offers low flush WC, sink built into vanity unit and corner shower. 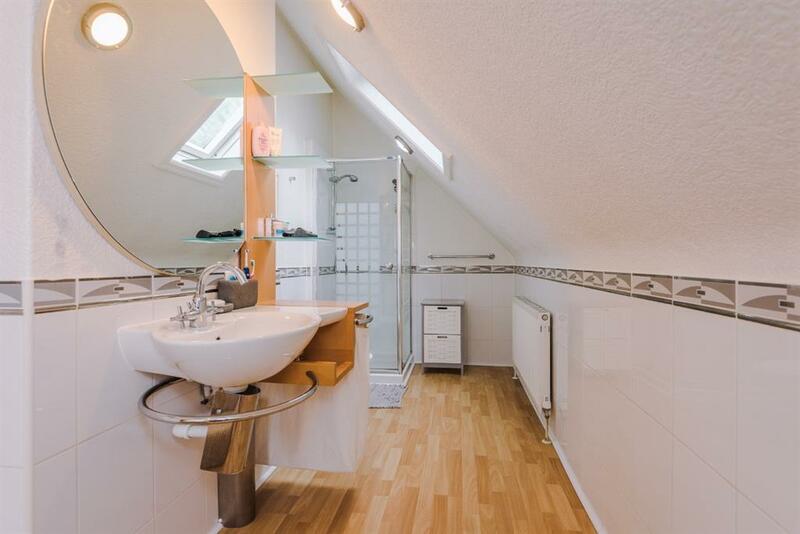 With two wall lights, Velux window to the sloping roof, side aspect uPVC privacy window, two wall mounted radiators and white tiled walls and flooring. 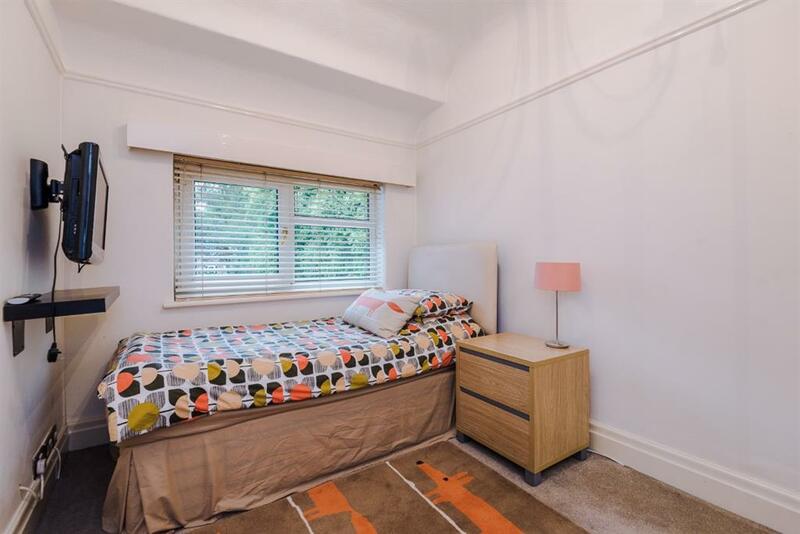 The second double bedroom offers ceiling light, cream painted walls with one papered feature wall, front aspect uPVC bay window, wall mounted radiator and brown carpet flooring. Cream robes to one elevation, with two matching bedside tables are fitted. 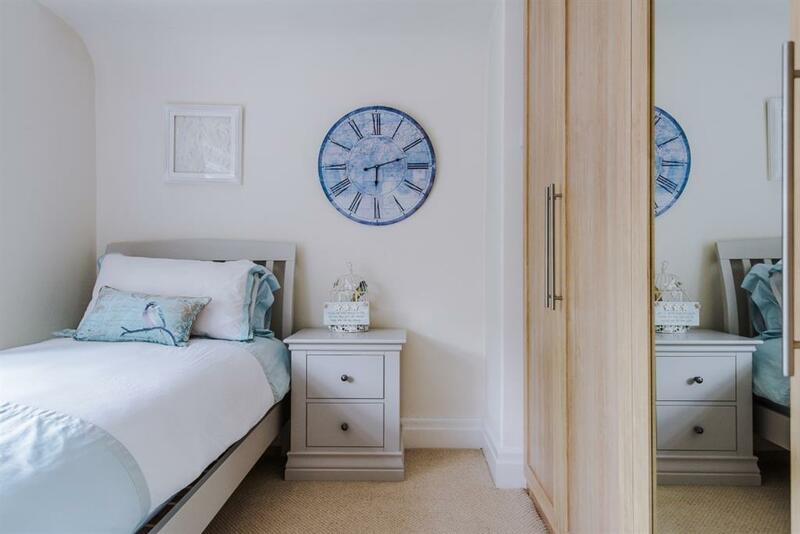 A third bedroom offers ceiling light, cream painted walls, rear aspect uPVC window, fitted robes to one elevation with mirrored panel and lights to the top, built in three drawer desk, wall mounted radiator and cream carpet flooring. 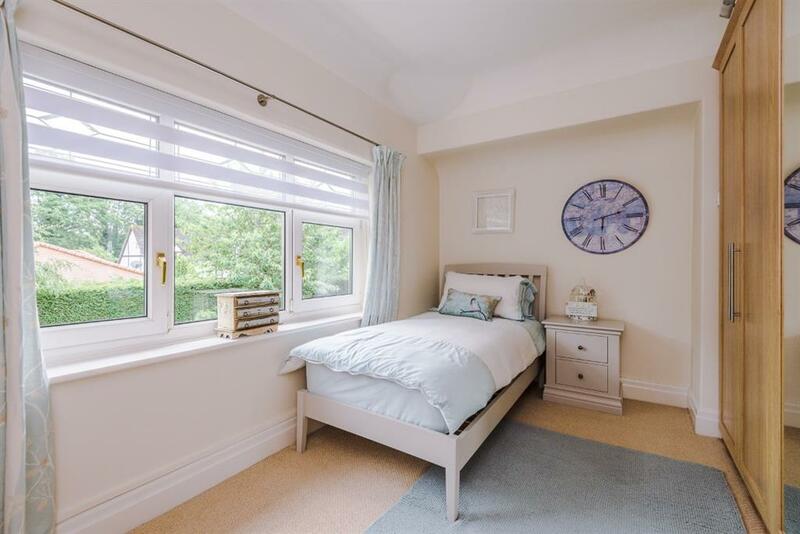 The fourth bedroom offers space for a large single room, with ceiling light, cream walls, uPVC window to the front aspect, wall mounted radiator, deep skirting boards and beige carpet flooring. A single robe with book shelving is in place. 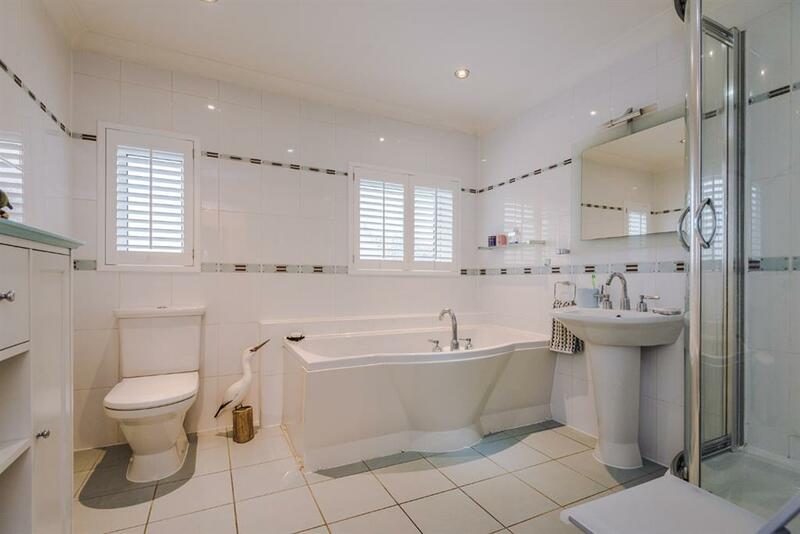 The beautifully fitted four piece family bathroom offers low flush WC, sink, corner shower and bath. With recessed spotlights to the ceiling, coving, fully white tiled walls, chrome wall mounted towel radiator, two side aspect uPVC privacy windows with fitted shutters and grey ceramic floor tiles. 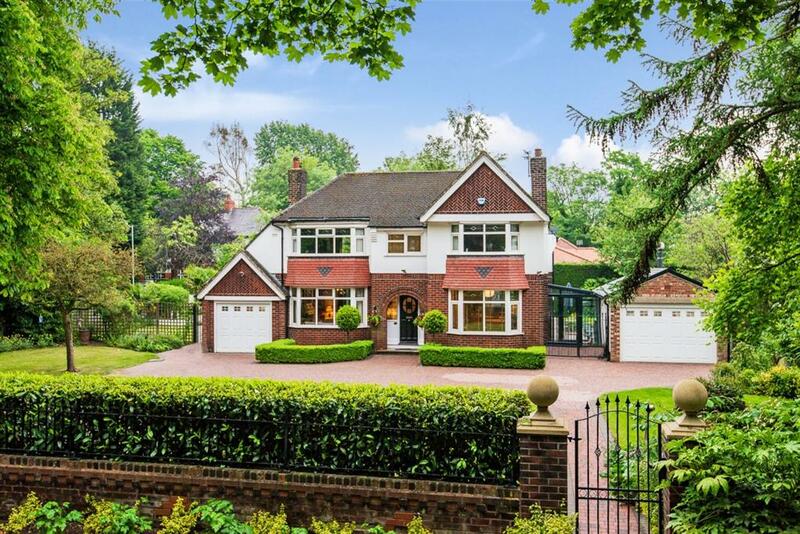 Set back from road, the front is enclosed via a decorative brick wall with hedge over, providing electric gated drive entrance, block paved driveway with space for multi-car parking, established trees, bushes, hedges and three front lawn areas with boxed hedge features in front of both bay windows. The left side of the property offers a bin store area and gated access to the rear. The right side give gated access to the glass corridor and Annex. 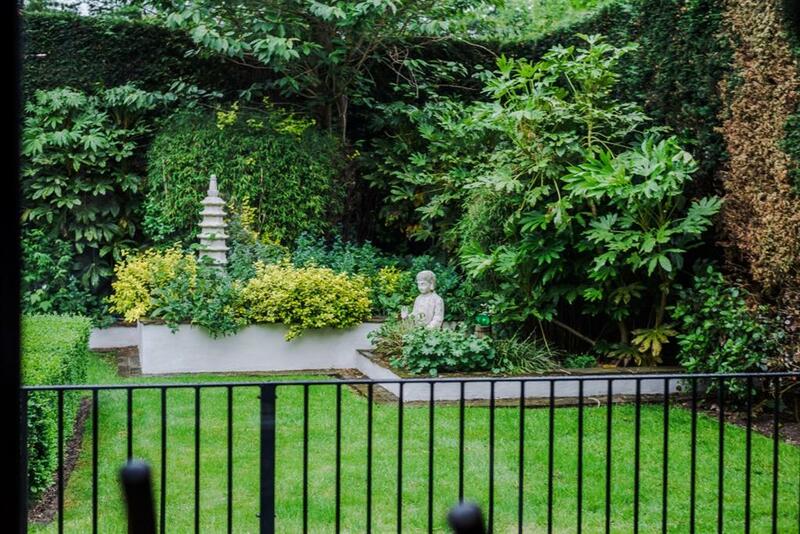 The south facing rear garden provides a well maintained spacious lawn, with Indian stone patio area with boxed hedges to the outskirts. 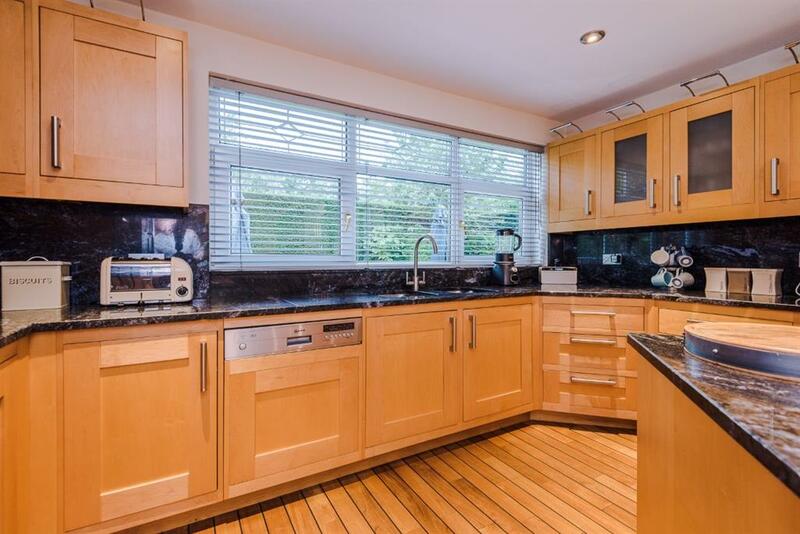 Fitted with three outside taps and electric sockets. 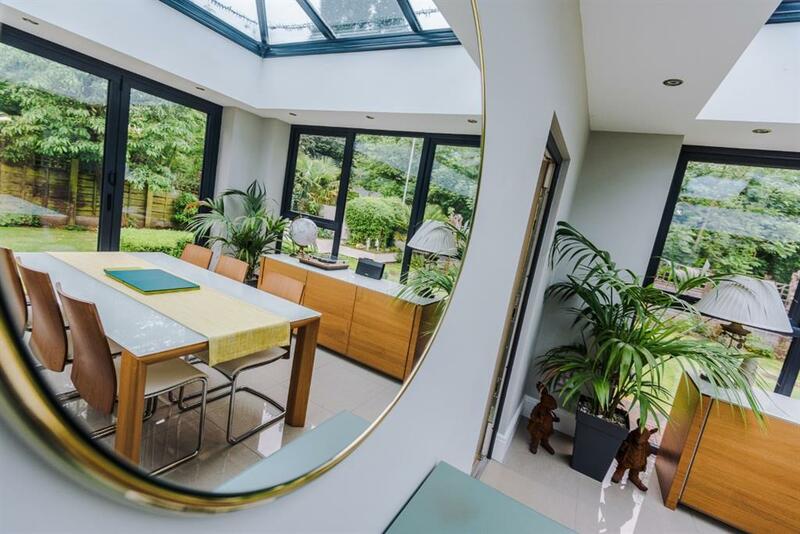 The property is situated close to the restaurants, bar and amenities of Monton Village, whilst still retaining ultimate privacy.